I may be a bit obsessed with this little green bean. Although, I really enjoy getting the pre-shelled edamame at Trader Joe's. However, our closest Trader Joe's is 45+ minutes away, so the next best thing (for me anyway) is to grow it in the garden. Personally, I think it tastes better knowing that I took part in the planting and growing of this fabulously delicious bean. 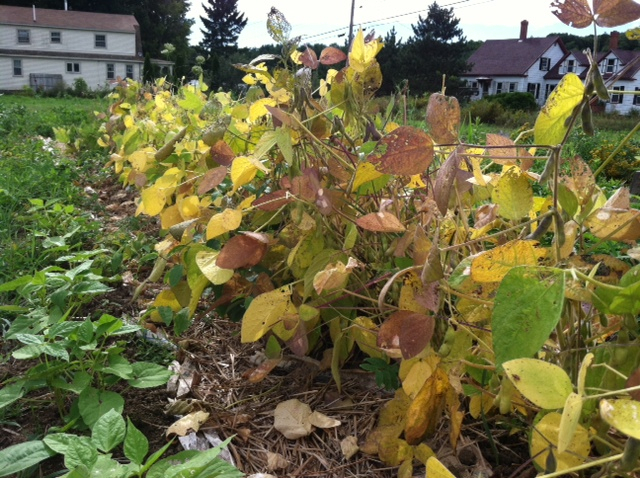 Here's my row of edamame - ready for picking! 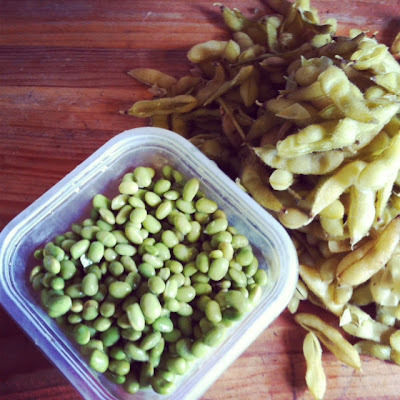 Preparing Edamame is time consuming, but it is really quite simple. Just pick it, boil it, shell it, and eat it. 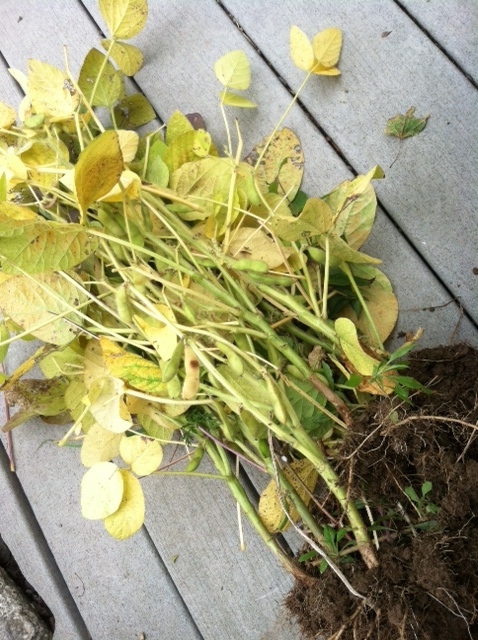 I usually just pull up the entire plant - root and all. The root is going to come out soon enough anyway. Right? Just remember, if you choose to just pull it out by the roots- it's probably best to NOT pick the pods off in your house. That's just asking for a mess. 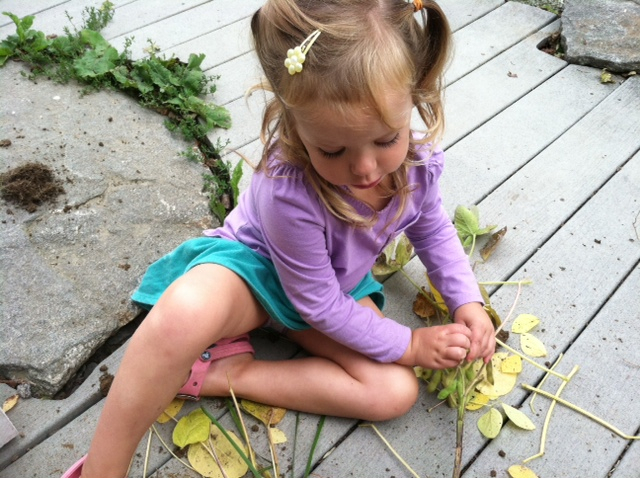 Today Izzy and I were smarter and chose to do the pod picking on the deck. Picking the pods alone is quite boring. I do suggest finding a picking partner. It's really easy - even a 3 yr old can do it! Next step is to add some salt to some water and boil it on the stove. Once the water starts to boil - put the pods in there. You only need to boil them for a few minutes. Then I drain them and run some cold water over them to cool them off and stop the cooking process. That way I can start popping the pods open and eating them I mean putting them in a bowl. Before you know it, you have a nice bowl full of edamame. If you are a fan of edamame - what are your favorite ways to eat it? I prefer to snack on it. Sometimes I'll add it into a quinoa salad, but most of the time I prefer it alone. now I wanna grow.my.own, too. 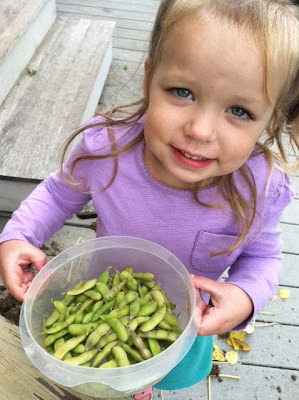 Edamame is a staple in our house. Often a snack and I love it in salads. One of my goals for next year is to plant a small garden. 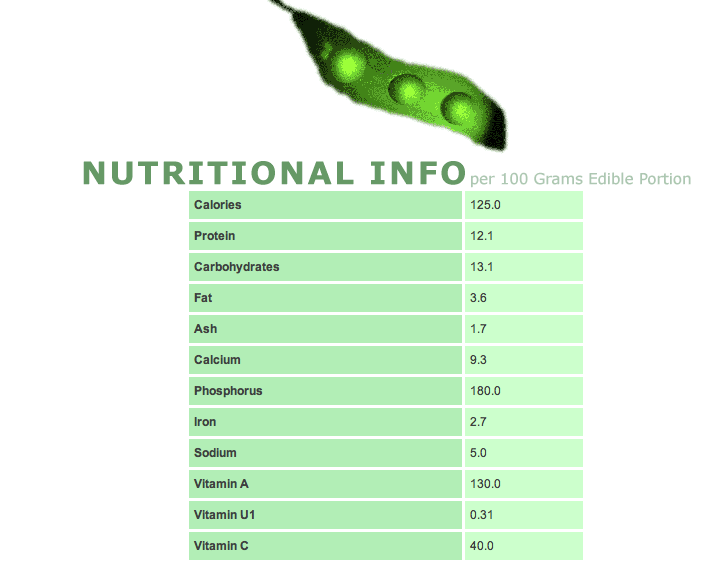 I'm adding edamame to the list! steamed and salty is my favorite way to enjoy edamame! YUMMY! I used to get the bags at Costco! So good! and I'm jealous of your garden. We rent an apartment and have tried doing a garden in pots... and it just doesn't work. AWESOME! And Yummy! I love all the garden pics! So fun! You have the perfect garden helper too. ;) I really should try edamame. I can't believe I haven't! Um, ok, never seen it growing LOL. I love edamame and need to pick some up again. I like to use it in stir fries and such. I prefer it unshelled and unsalted. Kind of the opposite of most people I suppose. It makes for a great hummus too. I love it! I like to steam it and put salt on it! Sooo good! I am a big fan of edamame. I had never thought to add it to quinoa but that sounds really good. I like to buy it from Costco in the shell, it comes in little bags to steam in the microwave, salt and shell and YUM! So cool! I do love edamame - straight outta the pod. I also love that you grew it yourself -- i'd never have thought to add that to a garden. i love edamame I never knew what the plant looked like though! so cool! I love edamame. Of course, I didn't much like them when I was growing up on a farm that grew lots of soybeans. ;-) Give them a cook name, and ooh la la! LOL. This is going on my list of things to grow in the garden! I love Edamame salted by themselves and added to salads. steamed and salty... yum yum!